We make C.S. Bell Co of Hillsboro, Ohio cast iron Farm Bells, Dinner Bells, Patio Bells, Marine Bells and Kid Caller Bells that have been made in America since 1858. Our steel alloy bell original patterns were made by C.S. Bell in 1886 and our bell patterns continue to manufacture bells and provide replacement parts for existing bells of any age. Our crystal metal alloy gives the pleasant and far reaching ring tone that has made C.S. Bell Co bells an American treasure for over 150 years. 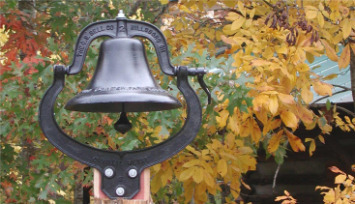 Despite years of weathering or storage with missing parts, your family bell can ring again and mount on a post to be displayed in your garden, at your door or on the farm. Thank you for considering a C.S. Bell Co bell for purchase. We have a little corner of the bell world that offers a durable product that will stand the test of time. You will find a C.S. Bell Co bell to cost considerably more, weigh considerably more and last considerably longer than other bells that are not made in America and cannot provide replacement parts, nor will those bells last for generations to come. A C.S. Bell Co bell can do more than call the kids to dinner; a C.S. Bell Co bell can become a lasting symbol of your family traditions. We offer you a bell that was first made by ‘American’s Original Farm Bell Manufacturer’, Charles Singleton Bell, and we will make him proud and you proud of your traditional Made in America Bell.